Van Phuc Silk Village – Vạn Phúc Ward of Hà Đông District, Hà Nội, has been known for many centuries with the brand name: Hà Đông silk and Vân Village silk. Located on the bank of the Nhuệ River with velvety mulberry groves and rice fields, Vạn Bảo fiefdom has been known as mulberry planting and silkworm breeding village since the 9th century. According to a local legend, progenitor of the profession is Madam A Lã Thị Nương, the beautiful and well-mannered daughter of the land of Cao Bằng. She descended the profession to villagers and helped “seven villages of La and three villages of Mỗ” to become the leading silk weaving villages in the country. Since long ago, the local people have honored her as tutelary god for their villages. Specialty of Vạn Phúc textile village that is known everywhere include “lissome bud silk” with high durability, plain silk, embroidered silk, satin silk, etc. All the materials help people to feel their clothing airy and cool. Thanks to perfect technology and fine art specifications plus rich and traditional colors and patterns, textile products of Vạn Phúc are very popular for all classes of people. Every year under the Nguyễn Dynasty (1802-1945), Vạn Phúc Village had to submit to the court in Huế a large volume of silk to be used as clothing for the royal family members and mandarins, and as contributions in the diplomatic relations. In the years from 1932 to 1936, Vạn Phúc silk was brought to the exhibition in Paris (France). In 1942, there were 18 artisans of the village to be awarded with honorary certificates. Today, Vạn Phúc has more than 1,000 looms in 785 households, three streets with over 100 stores trading in silk fashion. 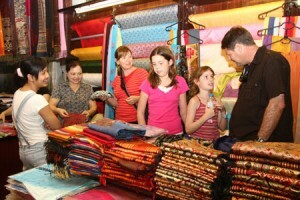 Vạn Phúc silk was exported to many countries of the world.